Usually the joint inflammation goes away after the cause goes away or is treated. Sometimes it does not. When this happens, you have chronic arthritis. Physical therapy involving exercises that help strengthen the muscles around the affected joint is a core component of arthritis treatment. Weight loss and maintaining a healthy weight can reduce the symptoms in those that have osteoarthritis, and they are also effective in reducing the risk of developing osteoarthritis. 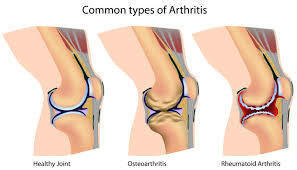 Every patient of arthritis has different types of pain and accompanied symptoms. Homoeopathic Medicines will also change accordingly. Aconite, Belladona, Bryonia, Ledum Pal, Apis, Silicea, Rhustox, Ruta, Kali Bich, Arnica, Ferrum Met. We will just go through some of the commonly used medicines. Aconite: Pains, restlessness with fear of some grave disease he will suffer from. Arnica : For pains which are due to mechanical injuries, fractures, contusions, bruised feeling as if beaten, traumatic affection of muscles. Everything on which he lies down is too hard. Bryonia : Stitching pain, tearing pain worse at night. pains increase by motion and better by absolute rest and lying on the painful side. Rhustox : Pains as if sprained, as if muscle or tendon torn away from attachment. Bones are like scraped by knife. Paralytic feeling, stiffness on rest and better by activity. Kali bich : Rheumatic Complaints along with gastric pain. Pain in spots shifting from one part to other. Ledum Pal : Rheumatic Pains in lower limb and pain moving upwards.Throbbing pain- more by motion ,warmth and better by cold application.